Any UK customer who registers before the end of the year will be able to claim a £10 package for free, no deposit required. This package is a mixture of cash and tournament tickets to allow new players to try Ladbrokes Poker. Download Ladbrokes Poker and follow the on-screen prompts to download and install the poker software. It will only take a minute or two and is very easy! 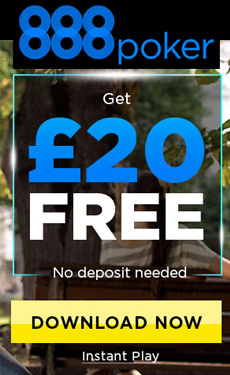 Then, just login to claim your £10 Free Welcome package. You will receive 5 tournament tickets worth £7.70 and £2.30 in cash bonus. You can find our GBP Tournaments in the lobby Tournaments >> Ladbrokes Lounge. £1.10 tickets can also be used in the lobby Sit & Go>> <2.50 tab. For your cash bonus, we suggest our 0.01/0.02 Beginner games in the Cash Games lobby but you will be able to play any cash game with stakes up to 0.05/0.10 NL or up to 0.10/0.20 FL. You can also play in any Sit & Go or Tournament up to £2.30. Players will be able to get this on top of the normal 200% welcome bonus up to £800 and a chance to share €10,000 in Freerolls & Tournaments! This special offer is exclusive to New Players, residents in UK. The £10 Free package is paid in 5 tournament tickets (3 x £1.10 and 2 x £2.20) and £2.30 in cash bonus, issued within 72 hours to eligible players that complete this claim form. The cash bonus can be used in conjunction with Ladbrokes Poker Welcome Bonus. Note: Players can only have once active bonus at a time. If player makes a first deposit before receiving the cash bonus, the welcome bonus will be the first active bonus. Players must earn the equivalent of 10 poker points for every US$1 bonus (or currency equivalent) to release the cash bonus. Cash bonus and Tournament tickets are valid for 14 days. Any unused bonus and tickets expire after 14 days. This offer is for New Ladbrokes Poker Customers only, new players must complete a claim form within 7 days of registration in order to receive their £10 package. Ladbrokes Poker does not tolerate any form of cheating or collusion. Any and all winners will be subjected to rigorous checks from our security teams before any prizes are awarded. Ladbrokes Poker reserve the right to use customer’s nickname and/or first name and last initial for use in reasonable amount of marketing and/or future promotions. The promoter reserves the right to modify, alter, discontinue or terminate this promotion at any time for any reason whatsoever without notice to players, using reasonable efforts to provide such notice. 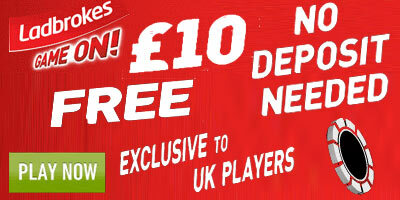 "Ladbrokes Poker: 10 pound free to play - No Deposit required (UK only)"